Talk about a long overdue podcast! Well here it is, finally. The three thread narrow is adored by many and to our surprise questioned by many too. Both Mal and Zede are huge proponents for the three thread narrow and just love (and we mean LOVE) using this stitch on the serger. Zede and Mallory dedicate this entire episode to their beloved #3TN. Have you ever tried the 3TN? Are you a convert? Was it not for you? Are you attempting the 3TN and need some tech support? We would love to hear your experiences and questions? Want to learn more about the Three Thread Narrow? Check out the 3TN Video! 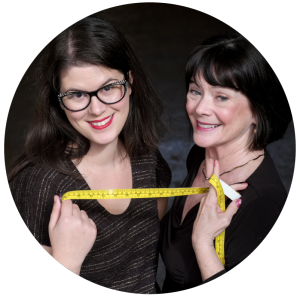 Mallory and Zede want to make more awesome sewing media for you. More entertaining and informative podcasts, more instructional videos, more online classes, and more time spent socializing and answering your questions on social media. Doesn’t that sound sweet? We think so too. To free up the much needed time to accomplish this, they have decided to use affiliate links instead of fulfilling and shipping orders themselves to make sure you get the amazing sewing products you need and deserve. They will still sell the SewHere boxes and other hard to find sewing tools and of course have some fun swag for you too, so don’t worry. But next time you need thread or pattern paper (#teamtrace all the way) we may share an affiliate link for a recommended product, this gets you sewing stuff you need/want fast and still supports us at SewHere. I’m fairly new to sewing and serging, and most of my projects so far have been fixing holes in worn out items. I remember reading somewhere that the four thread serger stitch was more stable so I assumed that meant that it was better in general. As in, it was less likely to break or come apart, not that it was stable vs wobbly or stretchy. I love how you explained why the 3 thread narrow would be better on 4-way stretch items like leggings. This will come in handy when I start making my own leggings. Thanks! 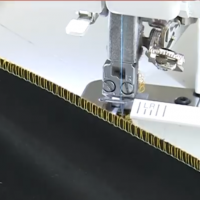 So I’ve been using this stitch since I bought my server around 15 years ago and I never knew it was a “thing” I just thought I was being thrifty only using 3 cones. I use it on wovens and just recently started on my path to glory with using it on knits. I never construct wovens with it but I’ve never had an issue with this stitch. Thanks for the passionate podcast. I found myself nodding my head and smiling in agreement a lot. Plus you made me feel special since I’ve always used this stitch and you two experienced sewists love it so much.